Our updated Roadmap for Systems Security Research has been released! This effort has been coordinated by the SysSec consortium, with young researchers in the area playing a leading role in shaping the Roadmap and the consultation of the SysSec community and Associate Members . 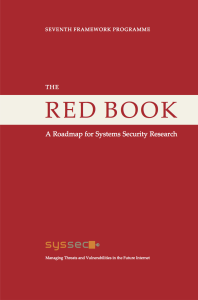 Our Research Roadmap, labeled "The Red Book" was published on September 1st 2013. It will also be printed in hard copies as a book. Click on the book cover or go to red-book.eu to get it. Join our mailing list to learn first about project and other systems security related news, conferences and activities. Over the past decade we are witnessing an ever-increasing amount of cyberattacks on the Internet. Prolific, ingenious, and ranging in style from large-scale worms to "below the radar" phishing attempts, cyberattacks have evolved to unprecedented levels of sophistication. To counter these cyberattacks, defenders are (mostly) developing safeguards, after the attack was made. In the meantime, while defenders are busy with mending the fences, attackers had already developed and planned their next strike. What we have realized over this past decade is that we are facing an asymmetrical threat: unless addressed, this asymmetrical threat will have us defenders locked into a vicious cycle: chasing after attackers without ever being able to catch up. We believe that in order to advance in the field of cybersecurity, we must act proactively and in synergy to change the rules of the game: instead of being reactive to cyberattacks, we should become proactive. Instead of cleaning after existing (or past) attacks, we should work on predicting threats and vulnerabilities and build our defense before threats materialize. Research combined with effective synergies is critical to realizing this game-changing plan and Europe has the expertise and the talent to succeed. Read our news on Facebook .